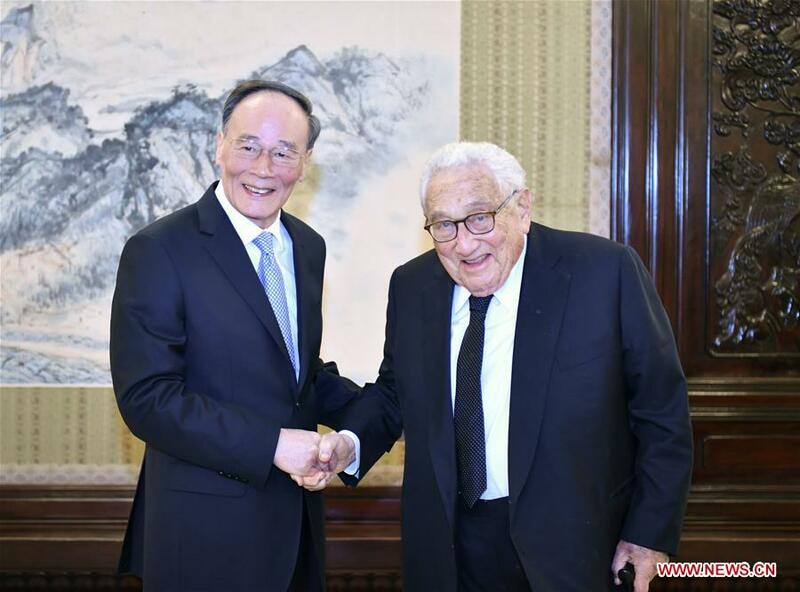 BEIJING, Nov. 10 (Xinhua) -- Chinese Vice President Wang Qishan Saturday met with former U.S. Secretary of State Dr. Henry Kissinger, calling on the two nations to properly solve differences and further promote bilateral ties in the future. During their meeting at the Zhongnanhai leadership compound in downtown Beijing, Wang said the China-U.S. relationship has had its share of ups and downs since the two countries forged diplomatic ties nearly four decades ago, yet it has generally moved forward. It has not only brought huge benefits for the people from both nations but also promoted the peace, stability and prosperity of the world, said Wang. China and the United States established diplomatic ties on Jan. 1, 1979. History has taught us that mutual respect, equal consultation and mutually beneficial cooperation are the only correct choice for bilateral ties, said Wang. He called on both nations to follow the trend of the times, continue to deepen mutual understanding and enhance exchanges and cooperation in various areas, properly solve differences, and explore ways to get along with each other under the new circumstances, so as to promote greater development of bilateral ties in the next four decades. Wang also spoke highly of Dr. Kissinger's contribution to the China-U.S. friendship. Kissinger said there are more common interests than differences between the United States and China. He agreed that the two nations need to solve current problems through equal dialogue and consultation so as to reach consensus on the future development of bilateral ties, adding that he is willing to make efforts to this end. Kissinger arrived in Beijing Wednesday and will leave on Sunday.